Staff Sgt. 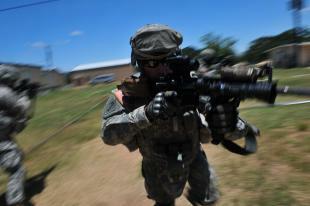 Clifford Fraipont of Fountain, Colo., moves quickly with his team to clear a room during Close Quarter Combat training May 21, 2009, at Fort Hood, Texas. Fraipont is currently serving with Headquarters and Headquarters Battery, 3rd Battalion, 157th Field Artillery, Colorado Army National Guard, 115th Fires Brigade.